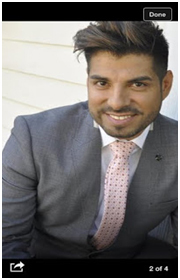 Uriel Saenz is a celebrated leader who is credited as fashion designer, Military (USMC) and media man. He is currently the Director of Multicultural Development for the Los Angeles Times where he is tasked with developing projects to connect with multicultural audiences (Latino, Asian, LGBT, Black, Women etc.). In this role he has managed to create opportunities like , Latinos De Hoy an award show that celebrates the accomplishments of contemporary Latinos in the US, The Korean Globalization awards , LGBT print and digital platforms , and many other projects that have gained the LA Times heightened visibility with-in these communities; while generating new revenue potential.